In the classroom setting of Manor College in Jenkintown, Herb Kaufman has, for years, taught students about the drama and intrigue of the War Between the States. But his preferred method of delving into the Civil War does not involve textbooks, lectures or PowerPoint presentations. It can&apos;t even be confined within four walls. In addition to being faculty, Kaufman is a living history presenter. He routinely works with Company C, 28th Pennsylvania Volunteer Infantry to provide up-close-and-personal encounters with the struggle of Blue versus Gray. 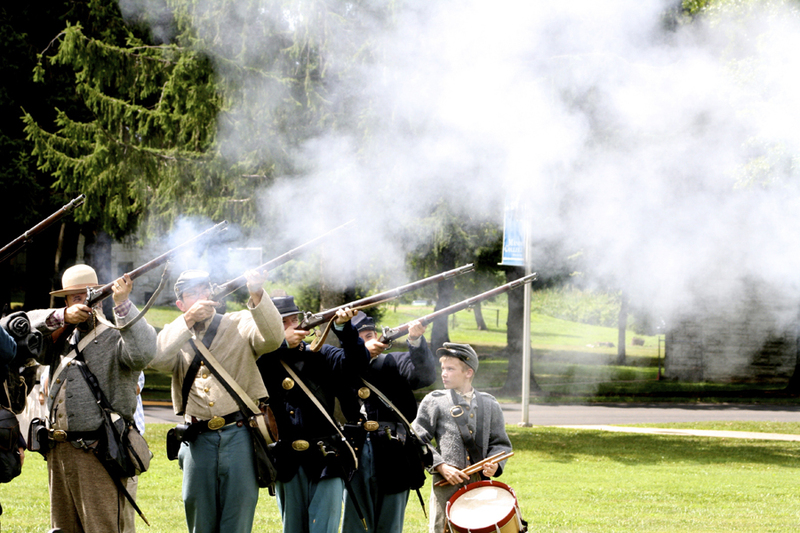 He and his fellow reenactors will be in full dress - with equipment and artillery that have been painstakingly recreated - in a living Civil War presentation on the Manor College campus on May 17. "I have been immersed in the history of that period since I was a kid," Kaufman admits. "I grew up in the Logan section of Philadelphia, and I loved history; I loved libraries; I loved to read." The drama of the Civil War captured his imagination, driven partially by the wealth of local resources available in the area. "Philadelphia is really a Civil War town," Kaufman assesses. "Historically, the city has more Civil War monuments, statues, libraries and memorials than it does Revolutionary War ones." That environment inspired him back in the 1970s to try reenacting, an interest that combined his love of research with his insistence on accuracy. "I was involved with reenactments for 15 years," he says. "It was like playing cowboys and Indians - but then again, not. We hold a mirror up to the public and give them a first-hand account of what life was like for men in the Army at that time." Kaufman and his fellow historians consult a period manual of arms to learn how period weapons work. Obtaining artillery, uniforms and gear involves contact with sutlers, civilian merchants who sell Army provisions, much in the same way troops obtained necessities during conflict. "They are very specific," Kaufman says. "They agree to match original materials exactly, so if something was made of wool then, it must be made of wool now. If something was leather then, it must be leather today. Brass buttons on the Union and Confederate troops are still made of brass for us. There is no polyester, no plastics." Kaufman&apos;s particular role is that of surgeon, where he displays and demonstrates - as much as is feasible - the often crude instruments of the 19th century. In recent years, he has scaled back his participation, in deference to the advance of years. "The wool is hot and heavy. It&apos;s not easy in the sun. That&apos;s why this kind of reenactment is a younger man&apos;s sport," he laughs. The 28th Pennsylvania Regiment has a rigorous schedule, with Civil War events scheduled all across the country. "It&apos;s not uncommon to have one a week throughout the spring, summer and into the fall," Kaufman says, further qualifying why he has scaled back. At Manor College, Kaufman is a founding member of the faculty of the Civil War Institute. He also teaches adult education courses in the Civil War at a number of local universities. His courses include "The Life of the Common Soldier," "Civil War Medicine" and "Meet the Generals." He is also a member of the editorial staff of the Civil War News. If you go, you will see the tents that served as mobile shelter for Civil War soldiers. Montgomery County accommodations have come a long way since then. For a list of recommended places to stay throughout the county, see our website.